Home / Self improvement / Are High-Protein Diets Safe? In recent years, high-protein diets, most famously the AtkinsTM diet, have received a lot of press. 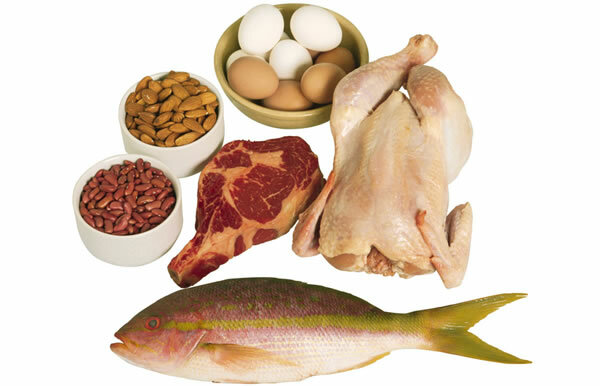 However it is not only fad diet followers that are increasingly turning to high-protein diets. Bodybuilders, sportsmen and women, and generally people wanting to build muscle or tone up are looking at high-protein diets. But the question is: is this type of diet safe? This article will look to answer this question and provide healthy options for those that want to follow a high-protein diet. Protein is known as ‘the building blocks of life’. This is because proteins make up the most essential part of the human body; DNA. Proteins are formed by 20 different amino acids, nine of which are called “essential amino acids”, meaning we can only obtain these through food. These amino acids join together to form protein, and it is the different sequences in which they form that makes up the different and unique strands of DNA. So as you can see, protein is involved in many processes in the body. But whilst it is important to consume adequate amounts of protein, it is also very important that it is good quality protein. Where Can We Find Protein? Protein sources can be broken down into two main categories; animal protein and plant-based protein. As we have seen above, protein is made up of amino acids, with a number of these being essential. Therefore the source of protein should, ideally, have as many of the essential amino acids as possible, whether that is from an animal or vegetable source. However as mentioned, it is important to understand that not all sources are equal and protein can be of poorer quality even if it contains a number of the essential amino acids. For example, a lamb chop provides 25% of total calories as protein but also 67% of total calories as fat – much of which is unhealthy saturated fat. Oysters, on the other hand, provide more than 80% of total calories as protein and very little saturated fat. Clearly, oysters would be a healthier option. Equally, eggs contain eight of the essential amino acids and so it is a good-quality source of protein, whereas another source of protein, like lentils, contains far fewer essential amino acids. Therefore eggs are a better source of protein than lentils. There are a number of health risks associated with a high protein diet. Many high protein diets, such as the Atkins DietTM advocate eating protein that is high in saturated fat, such as lamb, bacon, beef and ham, as well as cheese. Saturated fat can increase blood levels of cholesterol, and can lead to heart disease. Furthermore, a high protein diet could damage your kidneys. The kidneys are effectively a filtration system, screening up to 200 litres of blood a day. A high protein diet can block this filtering process and may cause kidney damage. Also, animal protein is acidic, and when consumed for over a prolonged period can cause the urine to become too acidic which can lead to the formation of uric acid stones in the kidneys. Another health risk from a high protein diet is bone fractures. A highly acidic diet increases the loss of calcium from the body and can therefore lead to a loss of bone density, which puts people at risk from bone fractures. The famous Nurses’ Health Study, which involved over 85,000 women, found that protein was associated with an increased risk of forearm fracture. Interestingly, this association appears to have only been found with animal and not vegetable protein. It is clear that the biggest issue with eating a high protein diet lies with consumption of animal protein, with a relatively low risk of a diet high in vegetable protein. Many perceived issues with eating a diet low in animal protein, or a vegetarian diet is that it lacks good quality protein sources. However, as alluded to above, it is possible to get all the essential amino acids from vegetable sources through food combining. Various vegetarian sources of protein will contain different amino acids, and by combining some of these, it is possible to get all the essential amino acids every day. Another good source of vegetable protein is soya. Most of the calories in soya comes from protein, meaning that it is an excellent source of good quality protein. In addition, the rest of its calories come from complex carbohydrates, making it an ideal food for vegetarians. The easiest and most versatile form of soya is tofu. This can be used in stir-frys, stews, casseroles and soups. Also, flavoured tofu can make an otherwise boring dish quite interesting! Moving away from the vegetarian options, fish is also a good source of protein. The best fish to eat is oily fish, such as salmon, mackerel and herring, as these contain essential fatty acids, which provide a myriad of health benefits. However, good lean white fish is also a good option. It is clear from the current evidence that a diet high in animal/red meat protein comes with a number of health risks. Conversely, a diet high in vegetable protein appears to offer a safer alternative, if consumed in the right way i.e. combining various sources. Therefore when answering the question of whether a high protein diet is safe, you must first ask what sources you are getting your protein from. Whilst being 100% vegetarian is not for everybody, it is worth bearing in mind the health issues that can arise from eating a diet high in animal protein, and one should look to restricting the amount you eat and having a few ‘vegetarian days’ per week.